Friday the 13th despite superstition surrounding the day was also a significant launch day for a lot of projects. Rihanna launched her holiday collection, and St. Vincent released her fifth studio album, Masseduction. 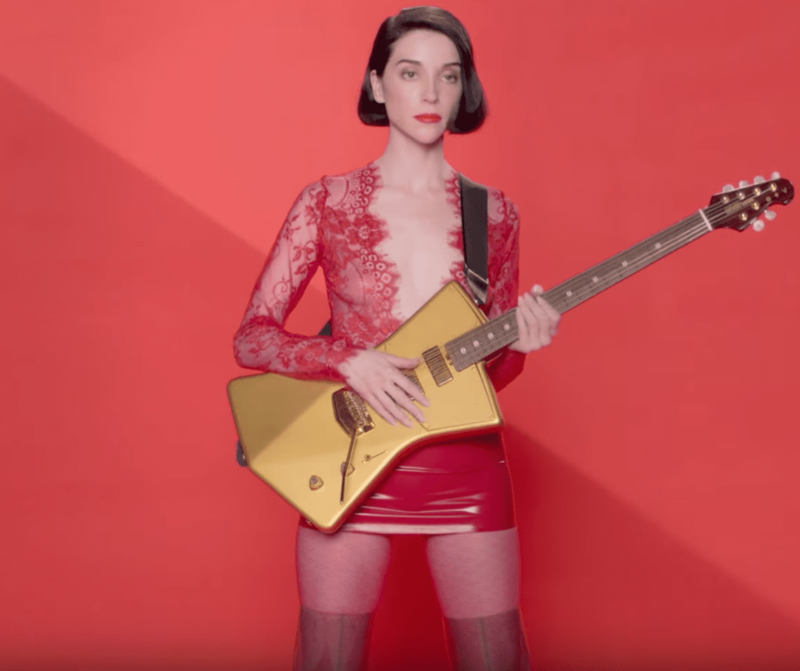 St. Vincent’s latest album is channeling some pop vibes and we’re digging it. The style that St. Vincent exudes in the videos she’s released thus far is full of power colors and edgy girl vibes. Ten days prior to the release of the album, she released a music video for her song “Los Ageless.” The music video is making a statement about women in Hollywood and the concept of looking perfect. The fashion in the video though is everything.St. Vincent is a style inspiration with her fierceness. Can we take a moment to gush over the latex fetish trends? Seriously, let’s look at some of the fashion she rocks in the video and how we can add it into our own fall wardrobes. One of the first looks that appears in the video is St. Vincent in a leopard print body suit against an all red backdrop. The clear thigh high boots paired with the melancholic face and the power red and leopard visuals is striking. Recreate this look with a body suit from Urban Outfitters and these Kendall and Kylie clear boots. The second look is serving some major fetish vibes with the latex dress along with the message of a plastic girl. The socks with heels tones down the fetish vibe and makes it more of a statement outfit. Try this look with a vinyl dress that can be found at ASOS and your favorite pair of heels. Monochromatic when done right can look polished and exude confidence. I am loving the red lace bodysuit with the red vinyl skirt. Throw on some of those clear boot heels and you’ll strut the street like a runway model. You can find a similar body suit and vinyl skirt at ASOS. Salma Ali loves writing, editing, and overall just creating things. She hopes to keep on doing the things she loves for the rest of her life and to inspire others to go after what they love. Life's a crazy ride and the best way to live it is in love.